This 41-acre park is in an isolated area of the Seven Mountains region known as the Stone Creek Kettle. 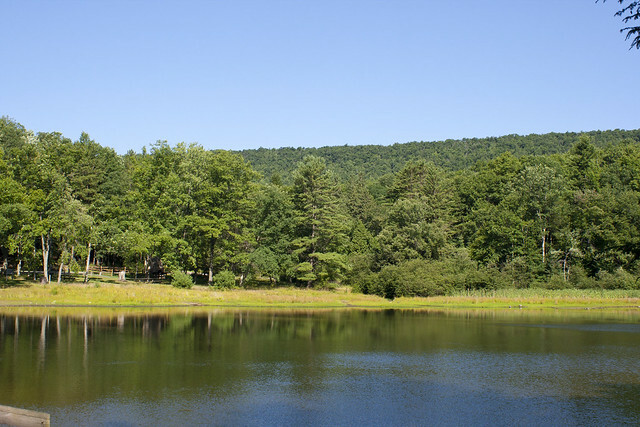 While this Centre County park is small in size, it is surrounded by an 80,000-acre block of Rothrock State Forest. Penn-Roosevelt is a good base for those seeking low-density recreation on this vast expanse of public land. Contact the Greenwood Furnace State Park office for facility seasons and hours. From US 322: One-half mile east of Potters Mills (where US 322 changes from two to four lanes) turn south onto Crowfield Road and drive six miles to park. From Greenwood Furnace State Park: Turn onto Broad Mountain Road at the park office. Follow the Penn-Roosevelt signs 12 miles to the park. For a wider map of the area, obtain a copy of the Rothrock State Forest Public Use Map from Greenwood Furnace State Park or the Bureau of Forestry office in Huntingdon. CAUTION: The roads to the park are not plowed in the winter. Penn-Roosevelt State Park participates in a carry-in/carryout trash disposal program for small parks. There are no trash collection or recycling facilities. Visitors are asked to limit the amount of disposable items brought to the park and to take all trash, garbage, and recyclables home. Campers should carefully burn any paper waste in their campfire, but please do not burn foil, glass, cans, plastics, or food waste. Directions to the nearest hospital are posted on bulletin boards.